Lift the head, not the legs! I need to be changed after all that hard work! Kato kitty likes to be included in the pictures too. A silly Cailyn video - 2:47 into it is the best! Our little girl is growing nicely! In the dr office scale....Budha belly! Cailyn also went to the Naturopath on Friday Sept. 23rd. The ND held her for a very long time, he was just so pleased for us and in awe of our baby Cailyn's perfection. He supported us throughout this journey and took good care of us during some stressful times and was very proud to meet his assumed niece. I did not snap a picture but will when we return on Tuesday. We are getting a customized formula for Cailyn through our ND since she had shown us an intolerance to whey proteins and since being switched to soy formula has developed a little rash. The formula will be an added cost but her health is most important to us. The formula base will be rice protein, non-allergenic etc. We are meeting the nutritionist on Tuesday to review the blend etc. We hope Cailyn takes to the new formula and that her skin clears up and her poops become easier. It's a sin to see her push so hard for a poop. So happy to be naked and wrapped in pink softness! Our first week home has been wonderful, perfect! Cailyn has had visitors and phone calls and emails. She feels very important as she spits up on every cute outfit she owns! After 4 visits to Service Ontario, we finally have a Health Card for Cailyn! Socialized health care is awesome. I was frustrated as they asked for our adoption documents, and I had to explain the situation over and over, but, our persistence prevailed with the help of one very lovely counter person and now Cailyn has her first doctors appointment today. Saturday we all went to a Christening for sweet baby Victoria Reese. The weather held out and the outdoor ceremony continued. Sunday we had good friends Gen and Winston stop by - they are expecting a baby boy anytime now and we are super excited for them! What an angel!! Her older brother starting to look like he has had enough of standing still. I am too cute - these pj's are too short for my long body! I love my jungle gym!! I dance like crazy when I lay down in it! Diggin the Rasta Hat from Tracy! Thanks Tracy - it is so warm, just a tad big now. Sunday visitors - another baby a brewin'! Airport arrival: Mark, Stan his brother, me and my sister Christine and of course Cailyn in her cocoon. .
My cute bow tie outfit from Colorado! Thanks Steph, Adam and Micah!!! Well, 5 weeks in India came to an end... We headed to the New Delhi airport around 11pm Tuesday Sept. 13th. When we checked in our baggage we were told we needed to be at immigration by midnight as Cailyn's visa expired then! I asked what time was it now, and the lady at the counter said midnight. We hustled it over to immigration to wait an additional 45 minutes...not sweating at all!! When we finally got to the immigration counter the gentlemen looked at Cailyn's visa and stated the obvious...expired! Luckily I am blond and white and was able to sweet talk our way out of this, making silly jokes while doing so. He took the bait and stamped Cailyn's visa, we were now officially free to leave India. The flight to Brussels was uneventful. Cailyn slept and ate and slept some more. She was amazing to travel with. We had our two hour layover in Brussels then homeward bound to Toronto. Again, Cailyn was a dream the whole way home. Greeting us at the airport was my sister, Marks brother and good friends Bo and Amy! 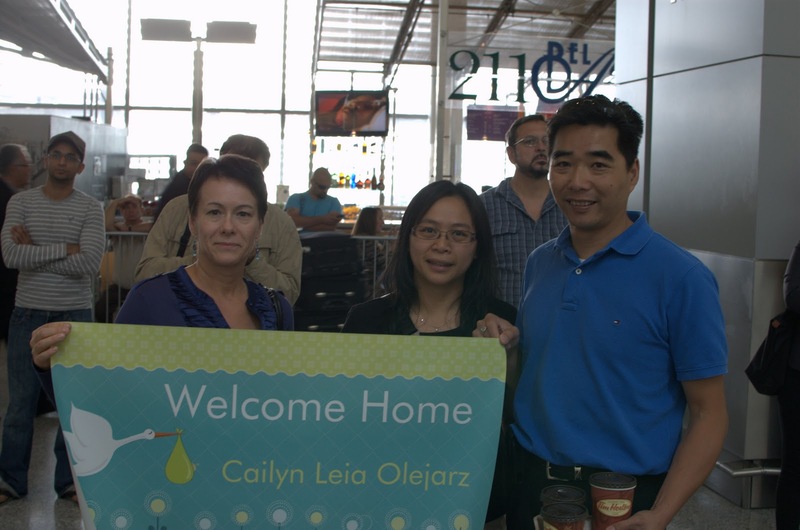 A lovely welcome home banner was waving in the air and the excitement and exhaustion were complied together. 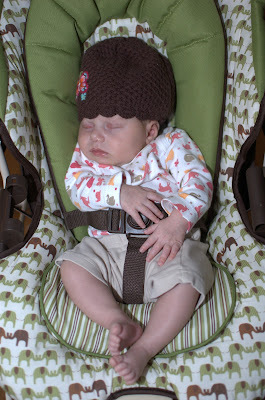 Like all new parents, we struggled to get Cailyn into her car seat, and eventually, we were on our way home. Home is so sweet, just the best! The first few days at home have been great. Cailyn has adjusted and so have we. We have had quite a few visitors, and lots more to come. Ahh...Brussels airport! The best layover ever! Harper came to bring Cailyn all her lovely hand me downs. Joe, Marks co-worker sends an edible fruit arrangement and comes with a card and gift from the gang at Global Egg! Thanks Global! Goofy by her wall sticker. 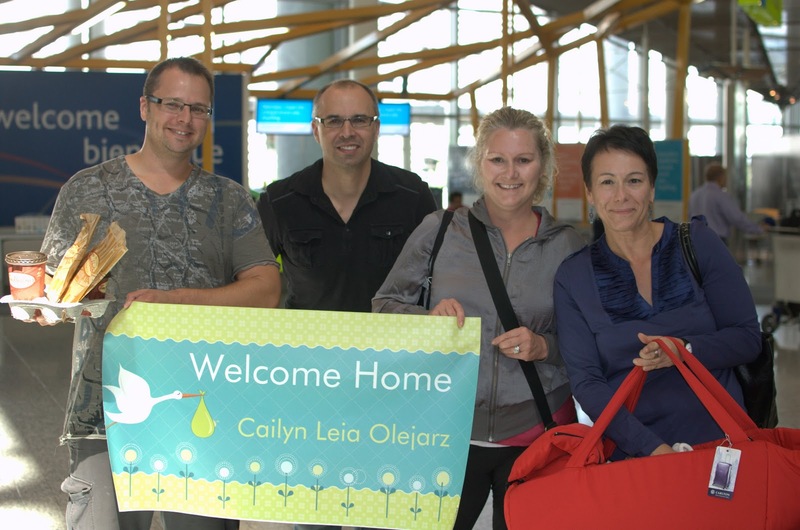 The welcome home sign on the front lawn!! Thanks Auntie Christine!!!! A great day in Delhi!! Today we went to the FRRO, and thanks to Poonam is was more than a breeze! We sat in the waiting area for 8 minutes, then one of the senior administrators called us over, asked for our passports including Cailyn's, asked for 3255 INR and that was it! Three hours later Poonams' assistant Sunil arrived at ILH with Cailyn's passport and exit VISA. Easy peasy!! Thanks to Poonam and her team the Indian exit process was easy, non-existent really. Compared to those before us, we know we had it beyond easy! Poonam and Cailyn. Cailyn looks excited to go home to Canada!!!! We have met a few people here cycling and also here for baby pick up so I decided to have us get together for dinner. We had Ireland, New Jersey, Denver, Toronto, Nigeria/UK and Victoria BC. It was such a great night! We met here at ILH and then headed to Hell for dinner. Cailyns black Auntie Temmy! She is a doll!!!! Jenn from Denver hand delivered a lovely gift from Stephanie and Adam, a beautiful outfit and some much needed and appreciated M&M's. Since we got home from dinner so late I was not able to get a pic. Thanks you guys!!!! Also, Posh and Lara from New Jersey brought Cailyn an adorable two piece outfit - so appreciated!!! I cannot wait to have Cailyn model all the wonderful clothes she has received as gifts! The last two days have been super super busy! Saturday morning we dropped Cailyn off with the Aussie girls and then we headed to Pahar Ganj market - not a place to take the baby. Rahul drove us in his BRAND new car, we were first to ride it in! We shopped a bit at the market then went back to pick up Cailyn and then have coffee with a couple from New Jersey area. After that, we rushed home to start getting ready for a new parents party in Noida. As we arrived home, Mark went to M Block market with Rahul to buy a car seat for babies. We talked to Rahul about having these available for SCI clients and he agreed and asked Mark to go with him and help him install it. They got it done and we used it all day today as we drove 3.5 hours to Taj Mahal and 3.5 hours back. Cailyn loved the car seat, and we enjoyed having her safe and comfy for such a long ride. The parents party was in Noida at the Radisson Hotel. We had good food and wine and champagne and beer and margaritas with Dr S, Vishal her husband , Neil her son and Dr Deene, embryologist. Babies included our Cailyn, Alex from Ireland and Bjorn from Norway. Also present was sweet Isla born in December 2010. Poor little soul, sadly we see alot of this here. Jersey gets to meet Cailyn! Testing out Rahul's new car seat! Dr S , Cailyn and me. Love this picture...such a wonderful doctor! Thanks for dinner last night! The drive to Agra is long! We left at 4 am so the first half of the ride was in the dark. When the sun rose we saw the villages along the way, the non-stop caravan of trucks and the farm workers starting their day by defecating on the side of the highway. Lot's to see on this trip! Rahul's home town is about 1.5 hours outside of Agra and as we drove through it he told us alot about his family, and shared some of his childhood memories. After seeing where he grew up we totally understand why he loves being in Delhi!! Finally made it to Agra! Buffalo! There was a heard of them just cruising down the street...I think they actually hit Rahuls new car. We had the cheesy photographer shots done, this is not so clear as we took a picture of a picture, but still, here is the fam at the Taj. We only stayed one hour at the Taj Mahal so it would not be to hard on miss poopy pants Cailyn. When Temmy arrived earlier in the week she brought these lovely dresses and shoes for Cailyn! Cannot wait til' Cailyn fits into them!